Why Are There Always Storms? Our group has been slowly studying through the church in the Book of Acts, which is really all about the acts of the Holy Spirit, and I was once again reading about Paul’s final journey… to Rome. And the entirety of chapter 27 is all about the beginning of his voyage and all of the storms they encountered, in particular the one that drove the ship up and down the Adriatic Sea for 14 days and nights. What came to mind were some lessons for us and some notes I found that I wrote in one of my Bibles that help me understand the storms we face in our life. Let’s look at some key parts of this voyage of Paul’s. Acts 27:9-11, 15 Now when much time had been spent, and sailing was now dangerous because the Fast was already over, Paul advised them, 10 saying, “Men, I perceive that this voyage will end with disaster and much loss, not only of the cargo and ship, but also our lives.” 11 Nevertheless the centurion was more persuaded by the helmsman and the owner of the ship than by the things spoken by Paul… 15 So when the ship was caught, and could not head into the wind, we let her drive. In his decision to ignore Paul’s warning the centurion pressed on and the result was their heading directly into an Euroclydon (known today as a Levanter), which blows through the Strait of Gibraltar with a gale force, resulting in extremely dangerous seas. All the ship’s crew could do was let the ship be driven by the wind. Doesn’t that happen to us when we ignore the Spirit’s warning and press ahead with our own agenda? When we forge on against the Word. It almost always starts out smooth and easy as it did for Paul’s ship, but sooner or later comes the storm and it’s always at a time when we aren’t prepared for it. It’s then that we find ourselves being driven by circumstances as the result of our impatience. We started out by testing the waters and everything seemed to be okay and so we pressed on seeking “comfort” in “our” decision. The result, however, was not what we expected. And its then that we often make a bigger mistake. As the situation for Paul and the ship became drastic, everyone began to fear and make preparations to abandon the ship. Acts 27:43-44 But the centurion, wanting to save Paul, kept them from their purpose, and commanded that those who could swim should jump overboard first and get to land, 44 and the rest, some on boards and some on parts of the ship. And so it was that they all escaped safely to land. The centurion was wise enough to listen to Paul and heed the direction he had been given by an angel. Are we wise enough to listen to the Holy Spirit when He speaks to us in the midst of our storm? Are we wise enough to seek His counsel or do we continue to press ahead, trying to find a way to sail out of our storm? I know that we’ve all been there and I am certain that we have acted both wisely and unwisely, which determined just how long we were going to be tossed about by the waves! Which brings us back to our opening question… Why are there storms? Let me share with you four reasons that I found written in my Bible along side these verses. I don’t know who gave them to me but they are well worth remembering as we sail the seas of life down here. Storms of Correction: These are the storms like the ones Jonah faced when he ignored the Word of the Lord, and we all know how that turned out. Jonah 1:2-5 “Arise, go to Nineveh, that great city, and cry out against it; for their wickedness has come up before Me.” 3 But Jonah arose to flee to Tarshish from the presence of the Lord. He went down to Joppa, and found a ship going to Tarshish; so he paid the fare, and went down into it, to go with them to Tarshish from the presence of the Lord. 4 But the Lord sent out a great wind on the sea, and there was a mighty tempest on the sea, so that the ship was about to be broken up. 5 Then the mariners were afraid; and every man cried out to his god, and threw the cargo that was in the ship into the sea, to lighten the load. But Jonah had gone down into the lowest parts of the ship, had lain down, and was fast asleep. Storms of Perfection: These are the storms that the Lord uses to perfect our faith. How often have we stepped out in faith, only to take our eyes off of the Lord and begin looking at our circumstances? But He is always there to save us, each time building up our faith in His promises. Storms of Protection: This is probably the most famous storm in the history of the world. And when you consider that the population of the world at that time, as calculated by many, was around 10.9 billion (compare that to today with only 7.4 billion occupying the earth’s surface). And out of 10.9 billion God could only find one man and his family that had been faithful. When He comes again, will He find many faithful to save? Gen 6:7-8 So the Lord said, “I will destroy man whom I have created from the face of the earth, both man and beast, creeping thing and birds of the air, for I am sorry that I have made them.” 8 But Noah found grace in the eyes of the Lord. 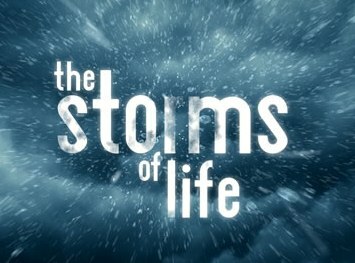 Storms of Direction: And these are the storms that we often don’t understand that are part of God’s plan that are directing us to His destination. And so often we don’t understand the reasoning behind them until we find ourselves standing on the very shore that He destined us for. I am certain that Paul had many opportunities to doubt that the Lord would get Him to Rome as he went through storm after storm, but he never gave up on the vision set before him. He followed God’s direction to the end and that is a lesson that we need to mind well. His vision and his goal never changed. Acts 28:23-24 So when they had appointed him a day, many came to him at his lodging, to whom he explained and solemnly testified of the kingdom of God, persuading them concerning Jesus from both the Law of Moses and the Prophets, from morning till evening. 24 And some were persuaded by the things which were spoken, and some disbelieved. ** Stay The Course was posted on July 7, 2009, and it is a great companion to this post. I think this is very true. I have been struggling with storm distractions lately. I need to “stay the course.” I appreciate your words of wisdom in the Lord. Thank you. I understand, that’s where I find myself again… they come and they go and all you can do is “Hold What You’ve God” until the Captain changes course. Blessings my friend.